It is to be entered in the Register of Associations and therefore its name is followed by e. V.
The Registered Office of the Association is 24558 Henstedt-Ulzburg. The fiscal year of the Association is the calendar year. The Association pursues exclusively and directly non-profit purposes within the meaning of section “tax-deductible purposes” of the tax code. Promotion, image-building, image enhancement and recognition of the breed “Pointer” as a family dog. Hereby all pointer breeds are included: English Pointer, German Shorthaired Pointer, German Wirehaired Pointer, German long-haired Pointer and pointer mixes. We want to give the pointer expression and voice. 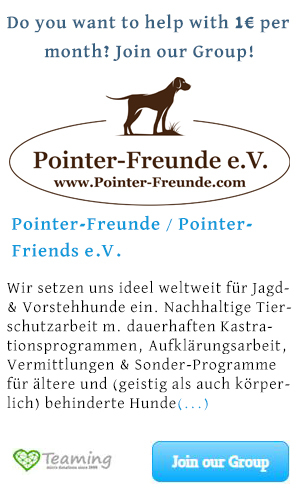 Help and rescue of pointers in distress within Germany, but also around the world. Hereby the main aim is to rescue the pointer in need, to be provided with veterinary help and loving care, so that it loses any possible fears and rebuilds trust in people. In exceptional cases this activity also includes the help and rescues of other dog breeds, in case it is deemed necessary in relation to the rescue of pointers. The quality and the standard (in particular veterinary, but of course in all aspects) of the care are hereby implemented on a very high level and is one of the most important basic statutes of the work of the Association. The finding of a place is done after a time for each dog individually. The Association is aimed at finding an appropriate home, in which the dog may be a dog and definitely not be “used or misused”. In the course of the adoption a questionnaire must be filled-in in advance by a possible future owner, there will be under normal circumstances a first and a follow-up inspection (any exception has to be approved in writing by the Board of Directors) and in the course of the protection contract there will be a nominal fee including a pro-rated reimbursement of the costs, to prevent an abuse of dogs and to achieve an appreciation. In the future establishment and keeping of a “multi-generation pointer Court” for the old, disabled and hard to adopt pointers. The Association is non-profit making; it does not primarily pursue its own economic purposes. Resources of the Association shall be used only for the statutory purposes. The members do not receive allowances from the means of the Association. No person may by expenses, which are alien to the purpose of the Association, or are favored by disproportionately high remuneration. Volunteers are only entitled to proven reimbursements. The members of the Board can receive adequate (fixed) compensation for their work or time. The General Assembly decides on the amount. Scale of adequacy is the charitable objectives of the Association as well as the nature and the amount of the activity. The General Assembly may authorize individual Board members to the conclusion and termination of agreements with other Board members. Member of the Association can be any natural person or legal entity that supports its goals. In addition to the membership in the Association, there is a non-voting associate membership. The Board of Directors decides on the acceptance after written application. For minors, the membership application has to be submitted by the legal representative. The Board decides on the application by free assessment. In rejecting the application, it is not obliged to inform the applicant the reasons for the rejection. Ordinary members (full members) pay an admission fee to be set by the General Assembly. The withdrawal from the Association is allowed at any time. It must be declared in writing to the Board. A member can be excluded from the Association if his behavior is grossly contrary to the interests of the Association. The General Assembly decides on the expulsion. On proposal of the Board of Directors, the General Assembly may appoint members or other persons who have been particularly worthy to the Association, as honorary members for life. On proposal of the Board of Directors, the General Assembly can take Associate They pay separately fixed contributions; they do not have the obligations of members and have no voting rights at the General Assembly. Ordinary members pay the annual fee in addition to an admission fee and are therefore full members with voting rights. Honorary members are exempt from the obligation to contribute and have no voting rights on the amount of the member fee. Associate members pay a reduced annual fee and no admission fee. They are not entitled to vote in the General Assembly. by legal entities through its dissolution. The voluntary resignation is carried out by written declaration to a member of the Board of Directors. It is only permitted at the end of the calendar year in compliance with a notice period of three months. A member can be removed from the member list by the Board if despite two reminder notes of payment the member fee is delayed. The Member is informed of the cancellation in writing. A member can be excluded by decision of the General Assembly from the Association if he has grossly violated the interests of the Association. Before the decision is taken the Member is given an opportunity to personally justify himself. Any written explanation of the parties concerned is to be read in the General Assembly. The members have to pay a membership fee. The amount of the annual contribution and the due date is determined by the General Assembly. A simple majority of the present voting members at the General Assembly is required to define the contribution amount and due date. A reduced contribution applies to pupils, students and pensioners. In addition, there is a hardship provision. The Board of Directors will decide upon the request of granting a reduced or free fee. Honorary members are exempt from the obligation to contribute and have no voting rights about the rate of membership fee. The whole Managing Board of the Association consists of the First Chairman, Second Chairman, the Secretary and the Treasurer. The Managing Board within the meaning of § 26 of the German Civil Code (BGB) consists of First Chairman and the Second Chairman. Each of them represents the Association individually, in and out of court. The First and the Second Chairman are each authorized to represent. The Board is elected by the General Assembly for a period of three years; each Board Member will remain however in the Office until a new election is carried out. Board members can be only members of the Association. The re-election of the Board members is possible. The Chairman is chosen by the General Assembly in a special election. The acting Board members remain at the end of their term in Office until their successors are elected. The joining of two executive positions under one person is allowed. The Office as a Board member ends with termination of membership in the Association. Decision-making on the admission of members. f) the closure of the Association. The ordinary General Assembly takes place once a year. In addition, a General Assembly must be convened if the interest of the Association so requires it or if at least one third of the members request this in writing, giving reasons. For each General Assembly the Board of Directors is notified in writing or in text form by email with an invitation period of two weeks, stating the agenda to convene. The general meeting is carried out either in person or virtual (online procedure). The virtual meeting is performed in a member’s only accessible chat room, with their identification data and a separate access code. The access code valid only for the current meeting will only be announced with a separate email shortly before the meeting. The obligation is imposed on all members to keep under strict wraps the identification data and the access code from third parties. The Chairman of the meeting is the First Chairman and in case of his absence, the Second Chairman. Should both be absent, a Chairperson is elected by the General Assembly. Each properly convened General Assembly has a quorum regardless of the number of members. Each adult member has one vote in the General Assembly. To exercise the right to vote another member can be empowered in writing. The authorization is granted for each General Assembly separately; a member may represent not more than 2 different voters. Associate members have no voting rights. The decisions of the General Assembly are taken by a simple majority of the valid votes. However, a majority of ¾ of the valid votes cast is required for amending the statutes and purpose of the Association. The decisions of the General Assembly are recorded in a protocol, which has to be signed by the Chairman of the meeting and the Secretary. The dissolution of the Association may be decided only in a General Assembly by the majority as laid down in § 10.9. Unless the General Assembly decides otherwise, the First Chairman and the Second Chairman are together the authorized liquidators. The foregoing provisions shall apply mutatis mutandis in the event that the Association is dissolved on other grounds or loses its legal capacity. In case of the dissolving of the Association or loss of the tax-privileged purposes, the assets go to the Association, the Frankenthaler Tierschutzverein 1906 e.V., which has to use them directly and exclusively for the protection of animals, or for the promotion of the breed Pointer.